When you first look at some things, you can determine quality. The Ruger Mark III Target .22 is one such item. The gun reviewed here is one I have shot numerous times and for this review put about 100 rounds through it. The gun is owned by one of the women who shoot with the Right On Target Group, and she is rightly proud of the gun. As soon as you open the box, you know you're looking at a high quality gun that is probably going to feel good in the hand and shoot straight where the sights are set. The picture at the top is a stock picture. The others are the picture of the actual gun reviewed. 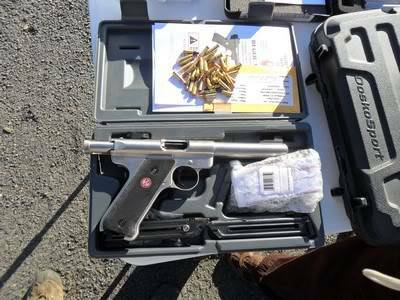 The Ruger Mark III Target comes with the usual assortment of items, two 10 round magazines, a gun case and lock. 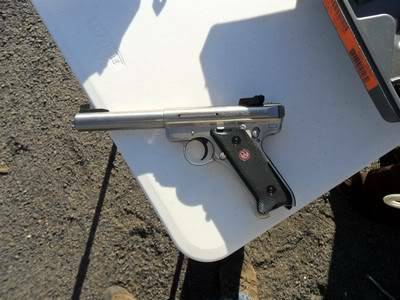 This gun was the stainless model and runs around $100 more than the blued model. It appears to me that it would be worth the investment to pay the extra bucks and get the ss version. Examining the gun, you find it has checkered grips with the handsome Ruger logo inserted. The gun has a 5.50 inch bull barrel topped off by a fixed front sight and rear adjustable competition style sight, adjustable for both elevation and windage. The barrel is tapped for a scope mount with flush stainless screws in the holes. At a hefty (for a .22) 42 ounces, the gun is not a kiddie gun. The gun has a manual safety that locks the sear in place and an internal safety. This is a serious .22 pistol that with some accessories is a high quality comepetition and hunting quality handgun. And as a side note, to our shooter friends in Massachusetts and California, it is approved for both states. Now for my personal experience and impression of the gun. The first time I picked up the gun when Rachel brought it to the Group the first time, I wanted one. That's a good start. Shooting the gun periodically when we all got together for our monthly shoots, I never lost that impression. And this time just made it worse (wanting one) because I really wrung it out and took some time with it. When I took it to a table to get it ready, the rear sight was loose so I got to sight it in for me which was ideal. The first set had me shooting slightly left. The second adjustment had the bullets going right where I aimed it. The 100 rounds put through it clustered in tight, neat little circles with targets set from 25 out to about 50 feet. The quality of the gun is evident in every inch of it, the fit, finish, and feel. The Ruger Mark III Target .22 is a hand full of gun and not for small kids or people with weak hands. Its bull barrel and heft all serve to bring recoil to virtually nothing and contributes to its expected and delivered accuracy. 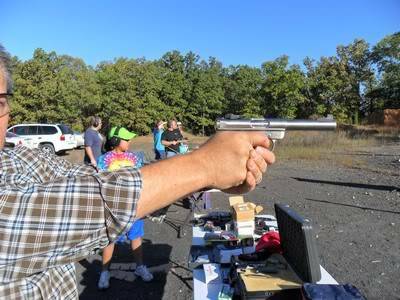 I had a full grip on it and it was as much a handful as any center fire pistol I have handled. 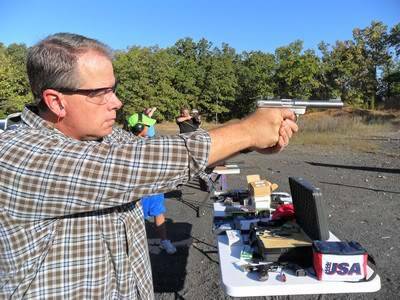 The feel of the gun gives a sense of confidence and the possibilities of what you could do as a serious rim fire competitor or hunter. The gun reviewed has been shot only with inexpensive target ammo, and at the time of this review had around 1000 rounds through it. In the dependability department, it has performed on a par with my Walther P22 with only a few malfunctions. With premium ammo, I expect this gun would perform flawlessly. Bottom Line: This is a gun that will turn heads at the range and people will want to look at and shoot. 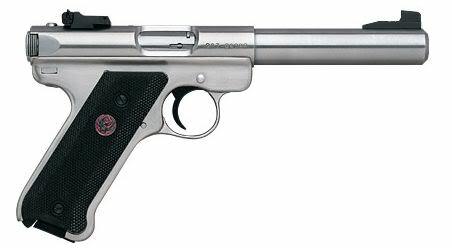 But the Ruger Mark III Target .22 LR pistol is not for everybody who wants a .22 caliber plinker. The msrp of the gun is $543 with the gun coming in at a real world retail price of around $450. This is not a price most people want to pay for a .22 pistol. If you plan on hunting with the pistol, plan on another $200 for a good scope. 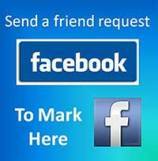 The gun is a high quality, satisfying gun that will serve you for a lifetime if it is cared for. It can be used for competition, hunting, or just ultra-satisfying shooting fun. Shooting the gun multiple times, doing this review, I have nothing negative to say about the Mark III. And a final note: Invest the extra $100 in the stainless model. The trouble free finish will be worth the investment.